Do you sing this to your child at bedtime? It’s so lovely it needs illustrations by Axel Scheffler. I haven’t yet, it might need a language adjustment. Axel Scheffler was busy he suggested I spoke to John Kenn. I found this both charming and joyful, though like all good stories it leaves me with questions unanswered. My questions are, what blend of tea were the cats drinking? Now it sounds more like market research than a kids story. I’m surprised more weren’t on the Earl Grey. That’s a particularly refreshing brew. 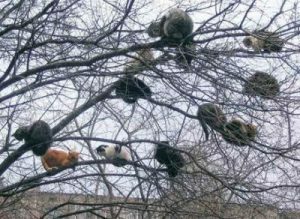 My next question is: why did you upload a picture of lots of cats in a tree, but not put it into your post? It was the wrong kind of cats. Either that or he’s an old man and forgot. Eh? What? Don’t know what you mean. I added it straight away, its always been there. Yep. Methinks the jester in thou pint has become a glutton for judicial punishment, hmmm? The comedian in drink has come to enjoy being trialled by jury? If only Nanette were here, if only. We’d tell her, “No, Nanette, No,” and everyone would understand. No, they wouldn’t understand. But they would DEFINITELY have heard. Nobody ever understands. Anything. Ever. That’s why I’m still here. If you suddenly died, there would be 15% more understanding in the world as a result. It’s you that’s holding us all back. “Is that a fact? Is that a fact? Yes. A bloke in the pub said it too so it must be true. A bloke in the park told me some science once. Those were the days. I’m not sure I’m ready to top myself. Can we pencil something in for 2065? You don’t have to top yourself. This is about suddenly dying. It’ll require very little action on your part.